Still tuning one string at a time? PolyTuneTM for iPhone is your short-cut to perfect and swift tuning, which will get you back to playing music faster than ever before! Just Strum. Tune. Rock! 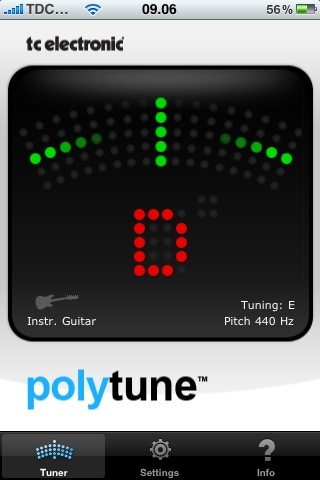 PolyTuneTM is the world’s first polyphonic tuner, a game-changing total tuning turnaround that will have future guitarists wondering how we ever got by without it. It couldn’t be done – until we did it. The magic lies in a never before seen approach to tuning aimed at speed, accuracy and ease of use. With PolyTuneTM, you simply strum all strings on your guitar or bass at once, and it will immediately tell you which strings need tuning! This cutting-edge tuning technology revolutionizes the way you tune and accomplishes what has been deemed ‘impossible’ until now: tuning all strings simultaneously! It really is as simple as strum – tune – rock, and this quantum leap forward allows you to get in tune fast, and back to doing what you love: playing. The PolyTune iPhone app is a 1:1 port of the award-winning PolyTune pedal tuner, and PolyTune for iPhone delivers exactly the same features and tuning technology as the pedal version. However, you probably don’t want to mount your iPhone to your pedal board, so that’s what the PolyTune pedal is for. PolyTune for iPhone, on the other hand, is the fastest and easiest way to tune at home, in the band bus or backstage before the gig. You can set the reference pitch anywhere from 435Hz to 445Hz, so you can play with anyone, with any instrument and in any situation. And if you like to drop tunings, you can go from E-flat all the way down to B.
PolyTuneTM is also a chromatic tuner with an amazing 0.5 cent accuracy, and it has two chromatic tuning modes: Needle and Stream. Needle Mode is the classic tuner view, and if you want a little more real-time information, the Stream Mode visualizes even the slightest pitch as a rotating motion. Whether you prefer the polyphonic or chromatic approach, the unique MonoPoly technology recognizes whether you play one or more strings and seamlessly switches to the right tuning mode. …but we sure can make it a whole lot easier! We want to help innovate the life of guitarists as we are passionate guitarists ourselves, working every single day to make all our lives easier and more rocking. In short, PolyTuneTM is here to give tuning a much needed kick in the A440!